This µModule implements a 16A H-bridge with rich feed-back options to create a closed-loop speed-controller application. The module interfaces to the external world using the TWI interface that’s common among all µModules. It also has an optional CMOS-level RS-232 interface. It can control motors up to 18V. 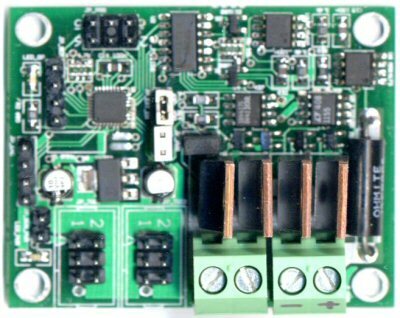 The TWI bus interface follows the µModule standards. There are six or four-pin connectors on the board, both with identical functionality. Two wires are used for the TWI signal transmission (clock and data) while the rest provide power and ground signals. The interface can be operated at a rate up to 400kHz. This module never initiates any transactions on the bus, it operates in slave-only mode. Status information can be acquired by polling and commands can be sent to the module at any time. The module implements the standard 8-bit register bank µModule communication protocol. The third powering mode has to be used if 5V operation is required. A wide range of feedback options are available on the module to provide additional health-monitoring and establishing closed-loop speed-control functionality. Both voltage (relative to the ground) on the motor connectors can be monitored as well as the voltage across the current-sense resistor which is proportional to the current flowing through the motor. Monitoring these values with a 10-bit resolution A/D converter precise knowledge of the current system status can be established. These measurements can be used to calculate the back-EMF response of the driven motor, which is proportional to the rotation speed. This value in turn can be used to close the control loop and create a true speed-controlled H-bridge. When more precise measurement of the rotation is required, an external quadrature encoder can be used and the signal of the optical gates can be fed back to the module. Two input pins are wired to a header for that purpose. The module on the top of the standard TWI interface, that is common among all µModules also contains a (logical level) RS-232 interface as well. This interface can be used to connect the module to other microcontroller modules or (after level-shifting) to a PC which doesn’t have a TWI interface. 0 int16_t RequestValue R/W Speed control request signal R/W (Scaled between -0x3fff and 0x3fff). 0x4000 is freewheeling and 0x4001 is braking. 12 int16_t MaxPositiveChange R/W Maximum single-step change in speed in the positive direction. If a bigger change is requested in RequestValue a ramp is generated. 14 int16_t MaxNegativeChange R/W Maximum single-step change in speed in the negative direction. If a bigger change is requested in RequestValue a ramp is generated. 16 int32_t Distance R/W Integrated actual speed value. An approximate measurement of the travelled distance. Hello. Have you tested this device with motor at 10 Amps? MBRS140LT3 Shottky is ok? This is a hard question to answer actually. I in fact have tried it with motors that consume several amps, but the current conducted by these shottky diodes depend a lot on the drive mode, the motor, the mechanical load and other factors. You might want to leave them out and rely on the intrinsic diodes in the MOSFETs for conduction – they at least have better cooling. You probably want to choose a drive mode where these diodes hardly conduct at all no matter what though… See here http://modularcircuits.tantosonline.com/blog/articles/h-bridge-secrets/mosfets-and-catch-diodes/ for more details on what to consider as far as the catch diodes go. It keeps the input-side lock-out FETs (Q1 and Q2) gate at a valid voltage. Do not use a 24V motor power? No. The drivers on this design can’t survive that much. what driver should i go for if i am interested in using 24volts? I dnt want the controller part so dont keep that in mind while suggesting a driver. Thanks a lot. Can you help me with the changes i will have to bring? It’s really not that different: you just need a pair of these, one for each side of the bridge. You probably don’t need R3, C6, and definitely won’t need L. What kind of FET and how many in parallel you need, that depends on your application. I would still at least provision for a gate-drive resistor on both the high- and the low-side (missing on the low-side in the application circuit). Just as they show, you can always populate them with 0-ohms if not needed. I don’t claim to understand why they’ve used two low-side FETs. But whatever the reason is, it depends on the application. You should be fine with only one FET. The two jumpers you mention are just for testing, you can leave them out. Thanks for a great deal of knowledge you provide on the blog. I was looking at the circuit for this h-bridge driver and I can’t grasp one thing. You’re using 4 n-channel mosfets, which means that you need a higher voltage on the high side. What technique are you using for increasing the voltage? It doesn’t look like you’re bootstrapping, but probably I’m not seeing something. Sorry for a dumb question, I haven’t noticed that LTC1155 has an internal charge pump. You are correct. There are several ways of dealing with this, please take a look at this article: http://www.modularcircuits.com/blog/articles/h-bridge-secrets/h-bridge_drivers/. In this particular instance, the LTC1155 has a charge pump as you’ve noticed. Does it mean that you can use PWM up to 100% duty cycle in your circuit? Yes, it does. However the PWM rate cannot be higher then maybe a 1kHz or so. I am new to this, so please, can someone explain me the procedure to keep following and maintaining the speed of the motor? I have already read h-bridge.cpp, but as i mention before, i am newbie and i could n’t understand it clearly. Also, why there are two different lines for measuring the voltage across the motor ends? The motor speed control is something I wanted to write about in a follow-up article in the H-Bridge Secrets series. It’s definitely more complex of a subject then to answer it in this format. The just of it, is that it’s a PID control loop. Until I get around writing that article, you google it, you’ll find plenty of good descriptions all over the web. What is the problem if i the q3 and q4 didn’t have an output?